This is the highest of a number of peaks on a ridge stretching NE from Inch. Moanlaur is the 374th highest place in Ireland. 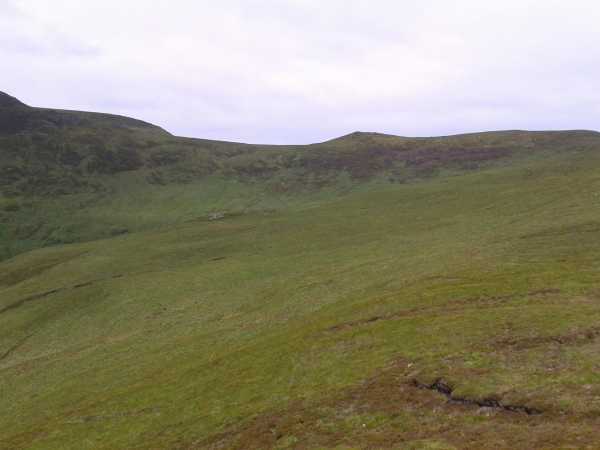 Picture from lackmt : aim for the hill of rocks in the centre of the photo, but keep to east. Picture: aim for the hill of rocks in the centre of the photo, but keep to east. I did this walk on Saturday (14th July 2012). I went up Lack mountain to begin with. Then, at the top, I suggest you try stay to the east side to avoid the low land which can be really boggy. When I was a child it was a joke when someone went missing to say that "He dissappeared down a boghole". You do need to watch your step here as you can be in 1m of bog water very easily (I have heard its good for skin). There are a number of sheep paths that will guide you but try keep to the east side as I said. Then try make it to the hill of rocks in the centre of the picture. From which there is an easy descent into the valley to cross the river.